Recently I was with my family at the beach in Westport, MA. My mind was about as far from Local Motors looking at the sand and the butterflies and playing with my boys, when a revelation was launched right before our eyes snapping my attention right back to the automotive revolution that we are about to create. 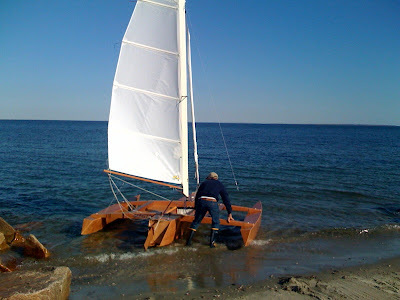 Here you see a picture of a dedicated craftsman launching one of the most beautiful boats I have ever seen, a hand crafted mahogany trimaran, named 'Skeeter, rigged with a roller furling jib- and main sail and built for two to go for a day sail around Buzzard's Bay. What you cannot see in this picture is the crowd of onlookers packed around the launch ramp waiting for the 'Skeeter to take wind. There were probably 30 people watching rapt with awe at this boat wright's accomplishment. What struck me the most is that boats get launched all of the time with NO fanfare, and yet when it is made by someone personally, the interest increases substantially. I myself was one of those audience members watching the skipper/builder and stopping to talk with him briefly as he shoved off to ask him about the wood used in construction. The bottom line is this: Create something yourself and become a hero in America. What a rush. I found this page last year, and thought it was a Cross 18' trimaran. But I believe now it's a 12' designed and build by Mark Gumbrecht. Do you remember this launching and the name of this guy ?